Although we had a chance to sample Chevy’s boosted Corvette earlier this year, our drive was slightly hampered by uncooperative weather. But after months of anticipation, we finally got a proper stint behind the wheel of the new Corvette Z06 – and this time the tarmac is dry and the air is nice and cool. As impressive of a sports car as the new C7 Stingray Corvette is, GM engineers managed to find ways to improve it, and the Z06 is the result of those efforts. Chevrolet has stated that there are no current plans for a ZR1 model for this iteration of the Corvette, so for those seeking the latest top spec version of the American performance icon, this is your Corvette. For now, anyway. What’s the idea behind the Corvette Z06? While it’s even more performance than the standard Stingray model, boasting more capability from nearly every metric used to measure sports cars, GM also sought to make the Z06 more accessible than top tier Corvette models of years past. 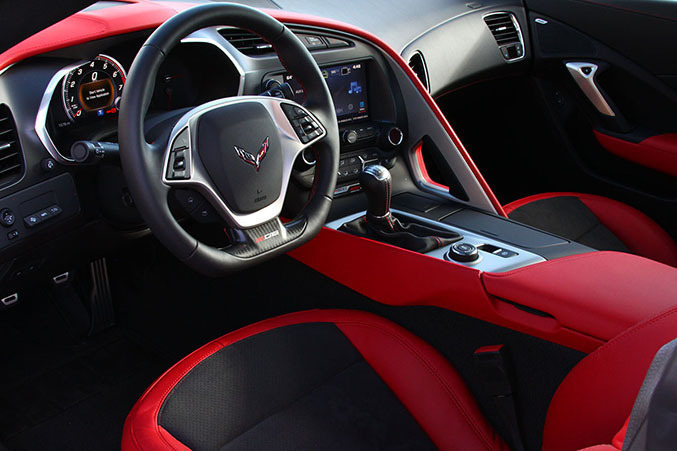 Accordingly, the new Z06 can be had with an 8-speed automatic gearbox as well as a convertible roof. But we’re here to do some driving – we’ll take our Z06 in coupe form with the seven speed manual transmission, thank you very much. 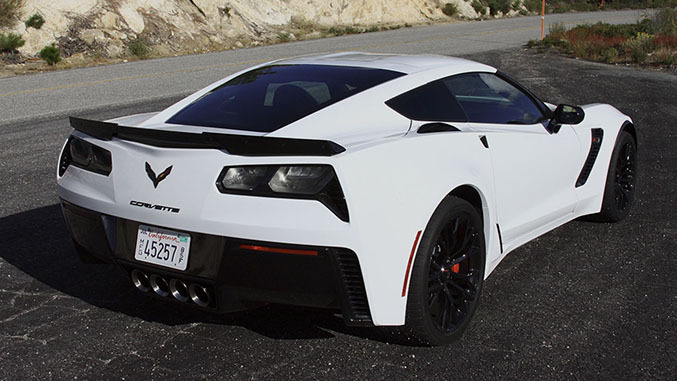 While the nomenclature slots this model in with what have traditionally been Chevrolet’s most track-honed Corvettes, it’s probably more accurate to consider it as the C7 version of the previous generation ZR1. Whereas the C6 Z06 was powered by a naturally aspirated 7.0-liter V8 making just over 500 horsepower, the new Z06’s drivetrain is a new supercharged and direct injected 6.2-liter mill, making this a significantly different animal both on and off track, and more akin to the 638 horsepower, supercharged ZR1. As one would expect, it’s not just the powertrain that gets upgraded over the standard C7 Corvette - the Z06 gets added grip in the form of Michelin Pilot Super Sport tires for the Z06 (Sport Cup 2 tires are equipped on models with the Z07 package), measuring P285/30ZR19 in front and 335/25ZR20 in the rear - an increase of width of 1.5 and 2.0 inches over the standard Stingray's setup, respectively. To facilitate the girth of this new rubber, the fenders of the Z06 were extended by 2.2 inches at the front, and 3.15 inches at the rear, in turn giving the Z06 an even more aggressive stance and track-derived look. Those meaty new tires are mounted on new light weight spin-cast aluminum wheels which measure 19 x 10 in the front and 20 x 10 in the rear. And those new wheels also showcase the new braking system as well, which includes two-piece steel rotors measuring 14.6 in front and 14.4 out back, with aluminum Brembo six-piston and four-piston fixed calipers. All told, the Z06 has the ingredients to run with the best the world has to offer, and at a starting price well below $100K, its performance-per-dollar ratio is among the best out there. But how does it all work together in practice? How does the drivetrain perform? 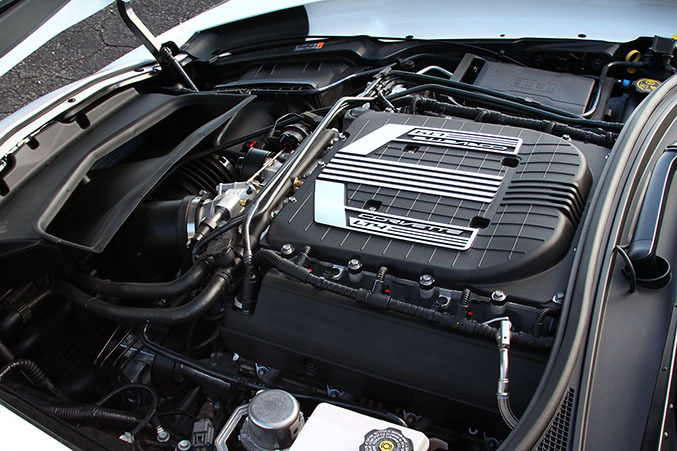 The heart of the Z06 is an all-new 6.2-liter supercharged LT4 V8, outputting 650 horsepower and 650 pound-feet of torque. While weight has gone up some 350 pounds from the previous generation Z06, output has been increased by nearly 150 horsepower, giving this 3500 pound coupe a level of performance potential that puts the new Z06 on par with competitors like the Dodge Viper and the Nissan GT-R Nismo. The new LT4 roars to life with a spectacular bark that sounds more at home at the Circuit de la Sarthe than Main Street, but with Chevrolet’s active exhaust system in place, quieting things down to general populace tolerance levels is as simple as a twist of the drive mode knob on the center console. 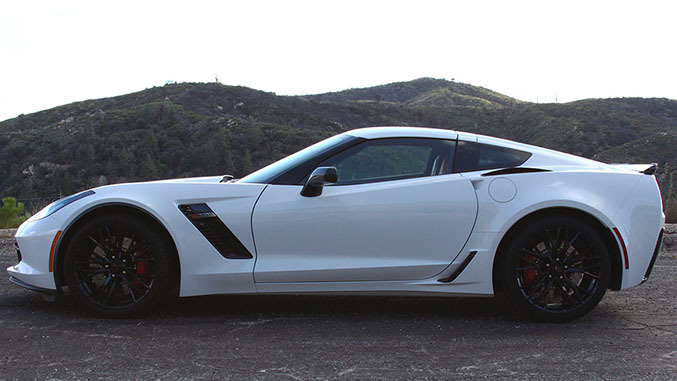 Like the C7 Stingray, manual equipped Corvette Z06 models now get a seven-speed gearbox. Clutch effort and feel is among the most well sorted we’ve sampled in street car context and the shifter feels reasonably precise and smooth, though with so many gates to contend with we did find ourselves searching for the right gear occasionally. When it comes to forced induction, your author generally prefers the linear power delivery of supercharging rather than the turbocharged alternative, and this LT4 is a great example of why. Power comes on like a tidal wave essentially from idle and seems to relent only when you run out of nerve, which is particularly noteworthy when you consider that the Z06 will blow past 90 mph while still in second gear. There are some caveats to all this newfound power, however. Along with more weight up front, some have accused the new top tier Corvette of being prone to heat management issues. While we never encountered any instances where the car’s fail-safes dialed back power to prevent damage, we did note that the temperature gauge climbed noticeably higher than we would have preferred after an extended stint through the switchbacks of Angeles Crest Highway. A few moments out of the throttle brought things back to normal, but it’s worth noting that this power plant does seem to run a bit hot. How does the Corvette Z06 handle? Although our test car is a standard Z06, rather than a Z06 with the Z07 package, which includes the aforementioned Michelin Sport Cup 2 tires, bigger brakes that are carbon ceramic, more specially tuned magnetic ride dampers, and a more aggressive aero package, the standard Z06 is far from a slouch when pushed to perform. Turn-in is sharp and precise, with steering that provides variable weight depending on how you have your parameters set. While the steering assistance is electric, as you’d expect, it’s among the better applications of this technology in terms of feedback, though it’s still discernable from a hydraulically assisted system. That said, in the context of street driving we’d consider the option to adjust steering weight to taste as a fair trade for communication, as the Z06 offers so much capability that you’re unlikely to find a situation where information about front end grip levels is more important. Out on the track that equation might be flipped, but considering the fact that this car is designed to spend the majority of its time on the street, the concession made seems fairly minimal. Chevrolet’s Magnetic Ride Control adaptive suspension remains among the best out there, providing a compliant, almost supple ride in Touring mode and unyieldingly flat characteristics when set to Track, with Sport providing the happy medium between the two. Dynamically it’s not dramatically dissimilar from the C7 Stingray, and we’d consider that a good thing, as the Stingray is among the best-handling sports cars out there. 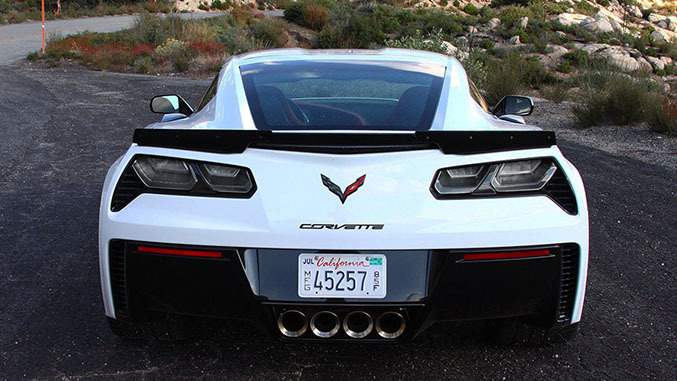 In the Z06 there’s simply more: More grip, more aggressive suspension tuning, more braking ability. Sure, there’s an extra 150 pounds up front, but with nearly 200 more ponies to pull it around, along with the dynamic upgrades, it would be difficult to detect outside of back to back lapping on a closed road course. Considering what an outstanding performance car the C7 Stingray is, it comes as little surprise that the Z06 excels at nearly everything it does as a sports car, and its price tag makes this car a compelling option when compared to the type of hardware it competes against. Add to that the vastly upgraded interior and technological upgrades included with the introduction of the seventh generation Corvette and the Z06 makes a pretty convincing case for itself. Yet the case for the Z06 is slightly dampened by just how capable the standard Corvette already is. Sure, there’s the added power and handling capability, but it exists at such a high threshold that we can’t help but wonder if a Stingray with a set of R-compound tires wouldn’t be nearly as entertaining both on and off track. It’s also difficult to shake our concerns about heat management. Truth be told it’s essentially a non-issue for the vast majority of potential Z06 owners, but those that plan to drive their sports cars hard lap after lap on a road course, it’s a point worth considering. Still, for those who demand the pinnacle of modern Corvette performance, it’s here, it’s extremely capable and regardless of any foibles, it’s an incredible performance bargain. Shop Corvette Racing apparel in the Winding Road Racing store.